Class VII rough terrain forklifts live up to their names. Designed for uneven surfaces and inclines, they are ideal for use on construction sites and in other outdoor settings where forklifts designed for smooth surfaces are not appropriate. Because of their extreme versatility, new and used rough terrain forklifts for sale are in high demand. The most distinguishing feature of rough terrain forklifts is their oversized, deep treaded pneumatic tires, but that’s not the only difference between these Class VII workhorses and other internal combustion powered forklifts. Most RT forklifts have more powerful engines than others and are counterbalanced to carry loads of between 5000 and 30,000 lbs or even more. For even greater traction, 4WD models are available and for greater maneuverability, 4WD steering models are even available. Telescoping masts for working at heights. Shooting booms for working up and over obstacles. Articulated booms have “knuckles” for even greater reach than shooting booms. An articulated boom can reach up, over and down. Forklift attachments are available to make a rough terrain forklift even more useful. A snowplow attachment, for instance, converts a forklift into a snowplow when needed. Because rough terrain forklifts generally have internal combustion (IC) engines, they should be operated in well-ventilated areas. However, lighter duty electric models are available and an LPG or propane powered truck can be used indoors or out. 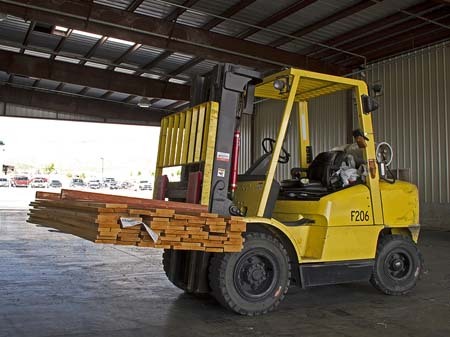 Lumberyards and other businesses that need to store and transport heavy materials both indoors and out often use a light-to-medium duty RT forklift instead of a standard forklift for all their materials handling needs. Choosing a rough terrain forklift can be a difficult decision. If you have decided it’s time to buy one instead of paying the high cost of frequent rentals, think about your future as well as present needs. For example, a construction company may be able to get by with a vertical telescoping mast on many construction sites, but you may find a more versatile used rough terrain forklift here at ReconditionedForklifts.com. Would that be a better investment? If you have any questions about the used rough terrain forklifts for sale you find here, don’t hesitate to call us at 1-855-742-0159, Monday through Friday, between 8am and 5pm Central Standard Time or you can email our home office in Effingham, IL directly at support@bahrns.com. Not just an online used forklift dealer, we are materials handling experts, with over 45 years of experience behind us.